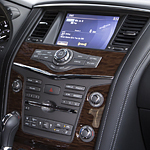 If you are looking for a full-size SUV, you should check out the Nissan Armada. At Lithia Nissan of Ames, many of our consumers choose this full-size SUV because it comes with a broad range of features, which include exceptional performance features. Let's check out its performance features below. The Armada is powered with the efficient 5.6L Direct Injection gas V8 engine. This engine comes with dual overhead cams and 32 valves. It also features VVEL valve control for an enhanced throttle response. This engine offers plenty of power and can tow up to 8,500 pounds. The 5.6L engine can reach 390 horsepower and 394 lb.-ft. of torque. The engine is paired with a seven-speed automatic transmission that features Adaptive Shift Control. The transmission comes with Downshift Rev Matching that includes automatic transmission fluid warmer, wider gear ratios, and idle neutral control. With this transmission, you will have more power at lower speeds and less engine noise at higher speeds.